3 Bedroom Semi Detached House For Sale in Rotherham for Guide Price £95,000. 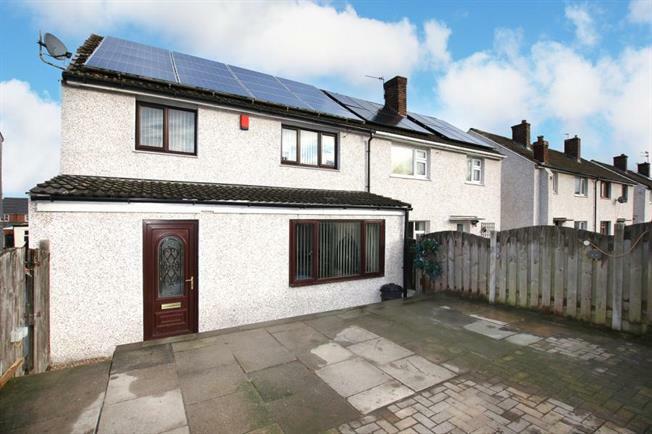 Offered for sale with no vendor chain involved is this spacious, extended semi detached home. Situated in a cul de sac which gives access to local amenities, transport links and having the benefit of owned solar panels. The property would suite a varied purchaser and in brief comprises of front entrance porch with door to stairs leading to first floor landing. Extended lounge / dining room having feature fire surround with electric fire and patio doors through to conservatory. Conservatory with side facing doors to outside. Dining kitchen with a range of fitted wall and base units in oak. Side entrance lobby with access to downstairs wc. First floor landing with three well proportioned bedrooms, master gives access to the loft currently used for storage. Upgraded family bathroom with a white four piece suite which includes a separate shower cubicle. Outside there is a shared drive which gives access to a larger than average garage / workshop with inspection pit. To the front of the property is a patio garden / off road parking.